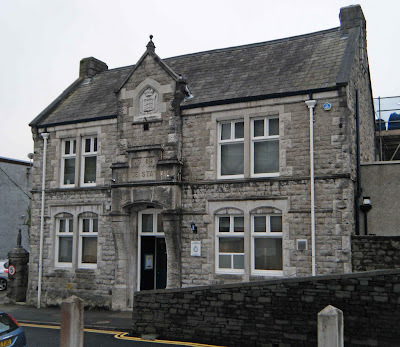 Ulverston police station (Neville House) lays just off the A590, sandwiched between The Ellers (A5087) and Neville Street. The police station occupies the site of Nevill Hall, also known as Neville Hall, and Nevyll Hall, a medieval hall that was said to have had a tower attached, and is traditionally said to have belonged to the Neville family, first being mentioned in around 1347. Above. The police station looking across County Road. The buildings on the site of Neville Hall, perhaps including the original hall and whatever was left of the tower, were eventually used as Ulverston's Work House, taking over from the Poor House that was situated elsewhere. This lease of life only lasted until around 1838, when the sheer number of people housed here meant that a purpose built building had to be erected. Some parts of the hall and its buildings were demolished to make way for the new Work House, whilst others were incorporated into the building. The tower was probably removed entirely at this stage, if it hadn't already been demolished beforehand. The hall survived for a while longer, until it too was dismantled in 1881, and the Police Superintendent's house, shown below, was built on the site seven years later in 1888. Above. Neville House from Neville Street. It's thought that Edmund Neville built the hall and its tower when he obtained a grant of the manor of Ulverston from Lawrence de Cornwall. The manor remained in the Neville family into Queen Elizabeth I's reign, until it was forfeited to the crown in 1569 after the Neville family instigated the Northern Rebellion (see this link for more information) The hall was sold to the town's leaders in 1753, and used as the Work House, as mentioned above, for the grand sum of £163. 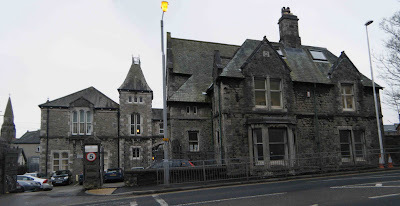 A link to a photo of Ulverston Work House. Mote Hill occupies a small plateau to the North East of Stirling Castle, just below Gowanhill. The site is thought to contain the remains of a small hill fort. The fort is easily accessible by following the walk that circumnavigates the castle's walls. Where the path meets Ballengeich Pass, cross over the road and carry on walking North East about a mile and a half. The walk comes out on the top of Gowanhill, and from here it is only a short distance to the top of Mote Hill. Above. A view of Mote Hill from the Wallace Monument. 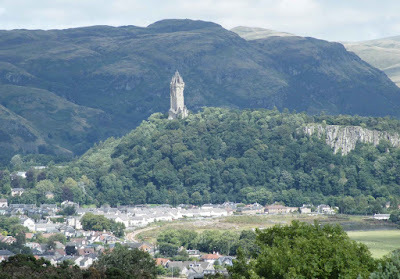 At the top of Mote Hill, you will find the Beheading Stone and two cannon looking out over Stirling Bridge. There are great views out over Stirling and its castle from here. Above. A view from the interior of the fort. The interior of the fort would have measured around ninety by sixty feet, and would have had a stone wall protecting its boundary. There are now only a few places where any sort of bank can now be seen here. A report dating from 1794 stated that a rubble wall was still visible....whether the stone has been robbed for use elsewhere, I don't know....but the summit is now fairly featureless. Above. A view from just beneath the summit of Mote Hill. The fort has been known as Hurley Haaky and Murdoch's Knowe in the past. It is thought that there may have been a second wall or bank defending the summit of the hill, laying some twenty five feet outside the first defences. There are still faint remains in this area, of what could be this earthwork, measuring some eight feet across. 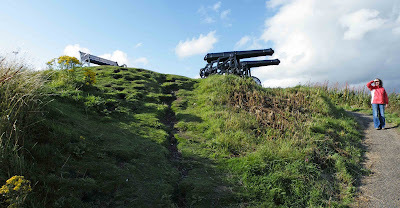 In January 1746, Gowan Hill and Mote Hill were used as artillery batteries by Prince Charles Stuart's forces. 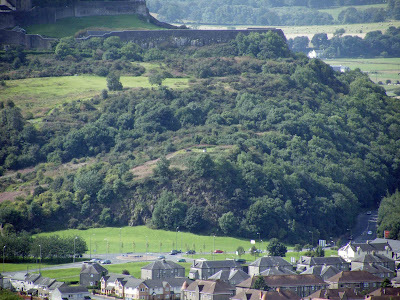 The retreating Jacobite army attempted to take Stirling Castle from the English garrison occupying it at the time. It didn't take the Castle's guns long to destroy the batteries and force the Jacobite army to abandon any hopes of taking the castle. Above. The 15th century Beheading Stone. The Beheading Stone can be found at the summit of Mote Hill. Traditionally we are led to believe that this stone was used for beheading those convicted of capital crimes. Some noteworthy individuals thought to have been executed on this stone during the 15th century, were Murdoch, the Duke of Albany and former regent of Scotland in 1425, two of his sons and the Earl of Lennox. 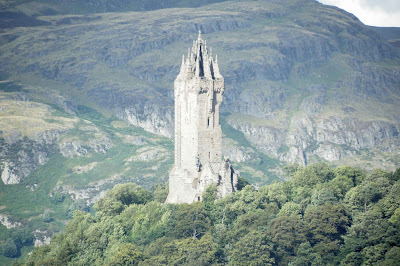 The impressive Wallace Monument, erected in memory of Scottish legend and hero William Wallace, towers above the surrounding countryside. The 220 foot tower, built between 1862 and 1869, is sited on the foundations of an Iron Age hill fort, of which only a fraction survives. Above. A view of the monument from the South West. The fort was built at the North end of Abbey Craig, a spur of high land that juts from the floor of the valley, and is thought to have been occupied between 500 and 780AD. Above. View of the monument from the South West. The sole surviving relic of this fort, is the crescent shaped bank that runs around the West and East sides of the summit of Abbey Craig. The bank, shown above and below, is about 260 feet in length, and stands to around five feet in height. It is made up of what is thought to be the rubble core of a substantial wall, that would have had a wooden palisade running its full length. Above. Internal view of the surviving bank....all that remains of the fort. The interior of the fort would have covered an area measuring roughly 175 by 125 feet. A second rampart can still be seen some forty feet to the East of the surviving bank, further down the hill. This second rampart stands to around four feet high, and is still nearly four feet wide. Above. View from the summit of the Wallace Monument, looking South West towards Cambuskenneth. The remains at the summit of Abbey Craig, which were no doubt more plentiful before the Wallace Monument was built, were said by local historians, to have been erected by Cromwell 's forces when he laid siege to Stirling Castle. It's only fairly recently that the idea of the hilltop as an Iron Age hill fort over a Cromwellian siege castle have been agreed upon. 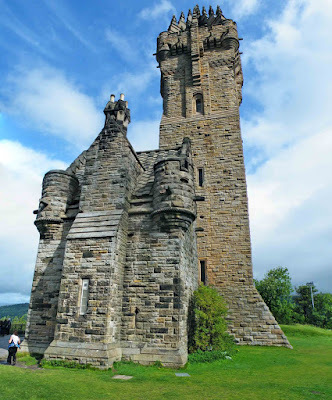 It is also said that Abbey Craig was the spot from which William Wallace commanded his forces, as they defeated the advancing English as they attempted to cross Stirling Bridge in September 1297. Above. 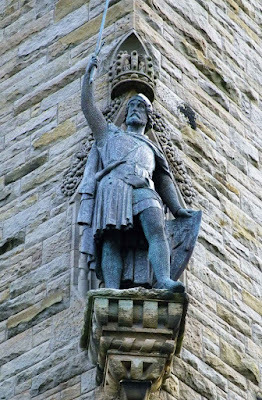 William Wallace looking out from high up on the wall of the monument. 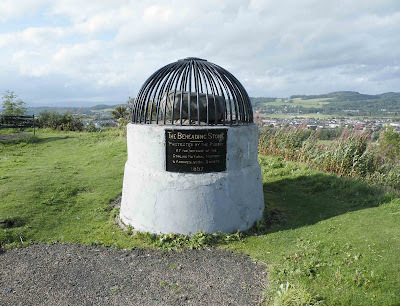 The monument offers fantastic view out across Stirling and the surrounding countryside. Although it's hard work getting to the summit, the crown, and you may have to struggle through the many people making their way down...it is well worth the work getting there. 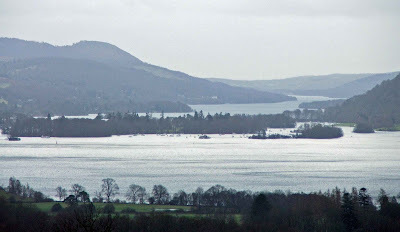 Belle Isle is the largest of Windermere's islands, and lays just to the South of Windermere and Bowness on Windermere. The island is about a mile long, and was previously known as Great Isle. It was bought for Isabella Curwen in about 1771, by her cousin John Christian. They later marries and John renamed the island Belle Isle after his wife. The island is thought to have been the site of a Roman villa, possibly connected with the Roman fort at Ambleside. Remains were found in 1774 during the building of a house, and from the descriptions given of the finds, it's possible that they indicated the site of a Roman villa. The island's presence on this website is due to the fact that it is believed that it may have been regarded as a Royalist stronghold during the English Civil War, when it was owned by the Phillipson family. The island is said to have been the subject of a short siege during the civil war, when it was attacked by a small Parliamentarian force lead by Colonel Briggs. His cousin Major Robert Phillipson is thought to have lightly fortified the island at this point, and although Colonel Briggs brought cannon fire on the island, probably from Cockshott Point to the South, the siege was lifted after about eight days(so we are told) by Robert's brother Colonel Huddleston Phillipson. Above. Bell Isle from Cockshott Point. Above. A landward view of Cockshott Point. The legend attached to this event, tells us that Robert, who we now know as Robin the Devil, angry and humiliated by the attack on his home, rode to Kendal and its Parish church by the river, together with a small troop of soldiers, with the intention of 'doing great harm' to Colonel Briggs. He rode into the church, and tried to attack Colonel Briggs, but was, we are told, beaten back by the church congregation. In his haste to save himself, he lost both his helmet and his sword, which are today displayed high on the church walls. As soon as I can find further information regarding the nature of any fortifications thought to have been built on Belle Isle, I'll post them here.